Something that is transparent and clear is called limpid. Water is god’s live affirming creation, which is one of the most limpid naturally available, bright and clear to be seen with clairity. Even the illustration of water here is brightly limpid! 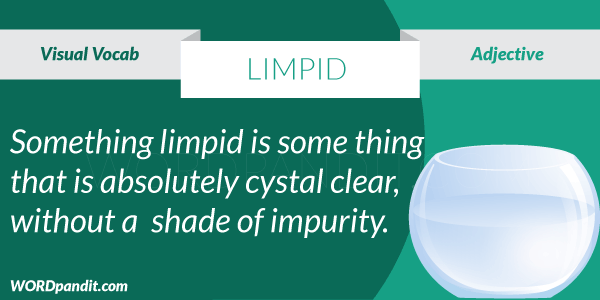 Limpid sounds a lot like lucid, or clear and bright. It can also refer to liquid, which in its most simplest form refers to water, which is also limpid. 1. The teacher was very limpid: either study or leave the classroom. 2. The price of glassware is judged by how limpid it is.